"Alan was someone who was deeper than numbers on a screen and charts on a page," Obama said in a statement. "He saw economic policy not as a matter of abstract theories, but as a way to make people's lives better." Krueger's influential labor research showed it's possible to give fast-food workers a pay raise without losing jobs. He also explored the high cost of the opioid epidemic and the dubious value of an elite college degree. "He had this extraordinary knack for engaging himself in hugely important questions where he really could shed a great deal of light," said former Treasury Secretary Larry Summers, who was Krueger's academic adviser and occasional tennis partner. Krueger was also a fan of rock and roll, who felt the rapidly changing music industry held lessons for the broader economy. His latest book on the subject, Rockonomics, is due out this summer. As he told an audience at the Rock & Roll Hall of Fame in 2013, a handful of big stars — think Taylor Swift, Jay-Z, Beyoncé — are raking in the lion's share of money from selling concert tickets. "The lucky and the talented — and it is often hard to tell the difference — have been doing better and better while the vast majority has struggled to keep up," Krueger said. That winner-take-all pattern is repeated throughout the economy. He titled his Rock & Roll Hall of Fame speech "Land of Hope and Dreams," a nod to one of his favorite rock stars, Bruce Springsteen, as well as the kind of upward mobility that Krueger worried is increasingly out of reach. "Most Americans are concerned that the tremendous increase in inequality that we've seen is jeopardizing equality of opportunity," Krueger told students at Oberlin college. "That's unhealthy for our economy. It's unhealthy for our country." Before he became chairman of Obama's Council of Economic Advisers, Krueger was a top economist in the Treasury Department. He also served as chief economist at the Labor Department during the Clinton administration. In a statement Monday, Princeton called Krueger a "true leader" who will be "deeply missed by his students and colleagues." 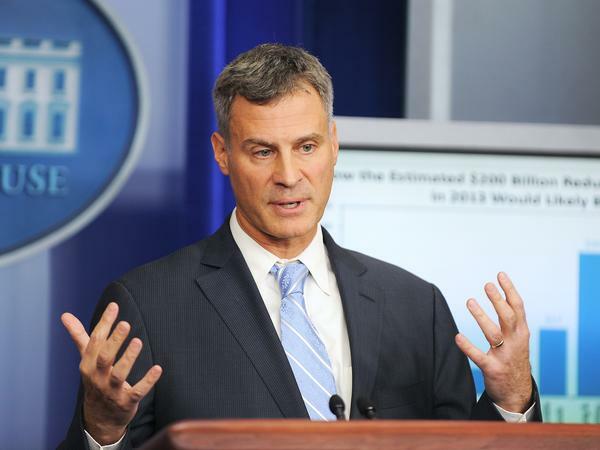 Not many people can command attention at the White House, Princeton University and at the Rock & Roll Hall of Fame, but Alan Krueger did. Krueger was an economist who specialized in questions such as, how does a minimum wage increase affect unemployment, and, what makes a hit song? He died over the weekend at age 58. And his family says in a statement he took his own life. NPR's Scott Horsley has this appreciation. SCOTT HORSLEY, BYLINE: Alan Krueger was an economic rock star who also studied real rock stars. "Rockonomics" is the title of a new Krueger book due out this summer that explores the lessons the rapidly evolving music industry holds for the broader U.S. economy. As he told an audience at the Rock & Roll Hall of Fame, a handful of big stars - think Taylor Swift, Jay-Z, Beyonce - are raking in the lion's share of money from selling concert tickets. ALAN KRUEGER: The lucky and the talented - and it is often hard to tell the difference - have been doing better and better while the vast majority has struggled to keep up. HORSLEY: That winner-take-all pattern is repeated throughout the economy, and it's one to which Krueger devoted much of his professional career. Krueger was a top economist at the Labor Department in the Clinton administration. And in 2011, he was named chief economic adviser to then-President Barack Obama. BARACK OBAMA: For more than two decades, he's studied and developed economic policy both inside and outside of government. HORSLEY: Former Treasury Secretary Larry Summers was Krueger's academic adviser and occasional tennis partner. He says Krueger did not approach economics as a game but a way to make the world better. LARRY SUMMERS: He had this extraordinary knack for engaging himself in hugely important questions where he really could shed a great deal of light. HORSLEY: Krueger's influential labor research showed it's possible to give fast food workers a pay raise without losing jobs. He also explored the high cost of the opioid epidemic and the dubious value of an elite college degree. He titled his Rock & Roll Hall of Fame speech Land of Hope and Dreams, a nod to one of his favorite rock stars, Bruce Springsteen, as well as the kind of upward mobility that Krueger worried is increasingly out of reach. KRUEGER: Most Americans are concerned that the tremendous increase in inequality that we've seen is jeopardizing equality of opportunity. HORSLEY: In a statement, Princeton called Krueger a true leader who'll be deeply missed by his students and colleagues. Scott Horsley, NPR News. Transcript provided by NPR, Copyright NPR.